There are all sorts of considerations when starting to think about having your very own backyard pizza oven, which is why it’s imperative to have an outdoor pizza oven guide. Pizza ovens are found in restaurants the world over. These appliances aren’t just limited to cooking pizza either – many of them are able to cook different meats, vegetables, and even fruit with ease. They’re able to be inside or outside and come in many different forms based on multiple different fuel sources. In addition to this, there are different sizes that can meet the needs of a wide variety of users – residential and commercial alike. Because of all this variation in pizza ovens, it may seem a little overwhelming on what to expect if you are in the market or just want to learn more about them. In this guide you will get a brief overview of some of the finer points of pizza ovens – first touching a history of these ovens along with the pizza they cook. From here is a section looking at the advantages and disadvantages of different fuel sources. We’ll go deeper still in our outdoor pizza oven guide, and look at the different types of pizza ovens, and then outline what to expect if you want to build your own outdoor brick version yourself. Finally, the outdoor pizza oven guide will be wrapped up with some basic cleaning tips. The modern pizza oven may rely on a series of different gadgets and hookups to cook food, but the first ones, date all the way back to ancient times. After the explosion of Mount Vesuvius coated everything in ash, several brick ovens were preserved – showing that the overall form of these types of ovens haven’t changed much over time. This style continued through much of medieval Europe – these ovens were either communally owned by a large family or under the auspices of the local Lord. It wasn’t until around the 18th century that designs started to split – increased demand for baking of breads resulted in variants popping up in Great Britain. As the industrial revolution kept chugging along, it seemed that metal type ovens would completely eclipse brick and mortar ones. Thankfully in the last half a century, there has been a resurgence of these types of ovens, and as a result of innovations in manufacturing, have brought their price down. Regardless, there are now many different types of ovens that rely on gas and electricity rather than wood to cook. Pizza itself has a little bit more complicated genesis – many of the precursors of modern pizza come from flatbreads stemming from everywhere from Sardinia, ancient Persia, Greece, and even as far as China. Like anything else, these flatbreads evolved to include different toppings including tomato sauce, olive oil, vegetables, and fish. It wasn’t until the 16th century in Naples that the name pizza came up – often described as a food for poor people. It was in the late 19th century that the modern pizza started to take place as its slow morph from a sweet treat changed into a more savory one, with toppings like mozzarella and tomatoes becoming staple ingredients. Wood Fired Ovens are by far the most commonly used in outdoor models as they can typically burn the hottest. These type of ovens are usually the brick and mortar types, but can also be found in metal constructed ones as well. Because they burn so hot it is integral that these ovens have a ceramic finish inside – this ensure that the heat stays inside, resulting in more efficient cooking and also safer space to cook. The advantage of this type of oven is that depending on the wood burned can result in a different smoky flavor to be imparted to your food. Hardwoods do especially well on this, with wood like cherry, apple, pecan, maple, and birch delivering sweet and smoky tastes. The primary disadvantage of this oven type is that it requires a little more preheating and attention than most. A gas pizza oven can use either propane or natural gas as a fuel source. These ovens are often easier to use and more convenient than their older wood burning brethren. They also are more viable as they are rarely limited in where they can be put – a courtesy a wood burning stove doesn’t have. This fuel source also has the advantage of preheating faster – typically needing half the time compared to a comparable wood burning variant. Some wood burning models can be retrofitted to include a gas option, giving you the best of both worlds. That all being said, gas does have one major disadvantages compared to wood – the cooking quality. While it is true they are easier to use and often cook faster, much of the flavor that is imparted through wood burning is lost, and therefore the pizza actually doesn’t have that special old-world flavor that was so prevalent in the pizza of yesteryear. Electric pizza ovens are the newest model. These ovens have many of the advantages of gas models, without the typical issues associated with gas fuels. This fuel source is ideal for residential people with a smaller cooking space as all it needs is a simple plug to get started, or for those businesses that need to cook on the go – such as those that cook out of trucks rather than a stationary location. While easily the most flexible option – available to anyone with electricity – there is a loss of flavor personality compared to wood burning models, much like the gas pizza ovens. Brick and mortar models are by far the oldest form of pizza ovens, but are considered the best to use. In residential use they can be fairly small – able to fit maybe a couple pizzas or equivalent at any given time. While commercial models can have huge cooking areas. Typically shaped in a igloo shape and lined with ceramic for best heat retention, you’ll often find that these models rely on wood, but can occasionally be outfitted with gas. In the back is where the wood is burned, allowing the heat to rise into the cooking area. Construction of these ovens are by far the most expensive and time consuming as they can’t easily be mass produced – often needing an expert to build them on location. These models are much more rustic and aesthetically pleasing compared to others, and because of this they might lack many of the conveniences found on newer variants. Note: The next couple oven styles are not designed for outdoor use. However it seems necessary to talk about them, while we’re discussing various types of ovens. Okay, so these next two pizza oven styles are primarily found inside of a food establishment, and not on the outside, because they run on hydro, and are not designed for the elements. Having said that, even though this article is called the outdoor pizza oven guide, I felt that this guide would be missing something if these two oven styles weren’t mentioned. 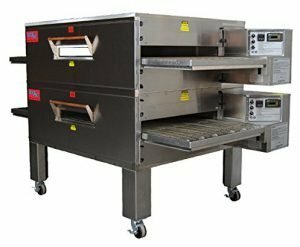 Conveyor pizza ovens are often used in many fast food pizza places as it cuts down on the most labor and is the easiest to operate. These models are usually electrically powered, and require only one person to prep a pizza and put it on the belt. By the time it reaches the other side the pizza will be cooked. Conveyor ovens are great at producing pizza at a high volume, and to maximize this volume many of them will have multiple conveyors stacked on top of one another. Nonetheless, these type of ovens often need a considerable amount of space to operate, and thus aren’t usually found in residential arrangements. Deck ovens are more vertically built and thus can take up less space than conveyor ones. These type of ovens usually have as much as a half a dozen decks to cook pizza, but take a little bit longer than other models. While convection ovens are by far the smallest in size and lowest in output. This type can be incorporated in countertops and have at least a couple racks to cook multiple pizzas. Because of their smaller size they are often great for those that don’t need to cook a lot at one time. In creating this outdoor pizza oven guide, we thought it would be helpful if we included info pertaining to building your very own pizza oven. So, without further ado, if you are a bit handy and thinking about building your own pizza oven out of bricks, you’re first going to want to get a good look at their overall form. Brick ovens are made with a basic foundation of brick, with a small squat house like structure on top of it. The ‘roof’ of the brick oven is constructed in spherical fashion and has a ceramic chimney, to let out any of the smoke. Many of the materials needed can usually be bought at your local home improvement store. Before you start, you need to pick an area and relative size of the oven. Expect your biggest cost to come from the bricks themselves – make sure not to get normal red bricks as they will break under extreme heat. You will also need pavers, angle irons for the walls and chimney, threaded rods, clay flue liner, clay, and sand. Surprisingly, you’ll also need a couple pieces of plywood and other lumber to serve as a jig to create your roof arch. In terms of tools you’ll need to have a hammer, chisel, tape measure, Jigsaw, circular saw, along with both a ⅜” and masonry bits. I really wanted to have a blueprint or video of how to build a pizza oven to include in this outdoor pizza oven guide. So, I’m sure you can appreciate how happy I was when I found this video of this cool guy, building his own backyard pizza oven. He does this time-lapse photography of himself building this badass pizza oven. It’s really well constructed, which makes it a great outdoor pizza oven building guide. Depending on your oven type, you’ll have to employ slightly different techniques in cleaning. Deck ovens are probably the easiest as they act like typical ovens found in an everyday kitchen – after they cool down use a scraper or wire brush to lift any stuck on debris that line the inside. Avoid using any form of liquid cleaner on the pizza stone itself, as this might crack it, and even flavor it. If it has a stainless exterior you can use a polishing agent and scrub any areas that are starting to get discoloration. Avoid rubbing against the grain of the metal as this can ruin the shine. Conveyor belts are bit tougher as they have more moving parts. First you need to remove the belt itself – which varies from model to model, so it’s best to check the instructions for your particular machine. After it is removed you need to soak the belt in an oven cleaner for approximately 20 minutes – because of the fumes often associated with this you should have it in a well ventilated area. When you wait the allocated time you can then scrub with a wire brush, focusing on any build up food that may have accumulated. Opening the doors to the oven you need to locate any metal fingers either above or below where the belt goes – spray these too with an oven cleaner and let them sit. After flaking off any food with a metal brush, you can then proceed to vacuum out the remainder of the debris. When cleaning a brick oven you need to wait a long time for them to cool off – ashes can remain warm even days after the last fire. Any debris that have been caked on can usually be taken care of with a scraper, but it’s important to try to clean these as you are cooking. You should also try to brush the bottom and sides at regular intervals even if you can’t see anything. For grease spills that are near the back of the oven, you can use a damp cloth with a stick. The most important part to clean though is the exhaust stacks – a commercial grade brick oven should be cleaned by a qualified chimney sweep. Smaller ones can be cleaned by anyone, but should probably be done once a month on a minimum. Pizza ovens come in a variety of forms and features. The oldest and most reliable is the brick oven – these are often found outside and can last a considerable amount of time because of their lack of moving parts. If you are uncomfortable building your own there are plenty of people out there that specialize in these type of oven construction. Convection, deck, and conveyor belt ovens are more updated versions that usually use either gas or electricity to run. Despite their name, most pizza ovens can cook a wide variety of different food groups. Because they have been around to some degree, since before written history, this type of oven has the widest variation of models allowing for either home or business use. I hope you’ve enjoyed our outdoor pizza oven guide, and hopefully it assists you in choosing the right pizza oven for you!